UPDATE: Ramaphosa wins most ANC branch nominations. Epic battle imminent. UPDATE: Final nomination results from KwaZulu-Natal indicate that ANC Deputy President Cyril Ramaphosa is so far the favourite to win the elective conference later this month. Ramaphosa has been nominated by 1,862 branches, while Nkosazana Dlamini-Zuma has received a total of 1,309. The vote can still swing either way at the final outcome, according to analysts. Read this story to find out more. 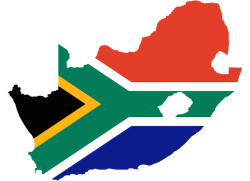 (Bloomberg) – South African Deputy President Cyril Ramaphosa won endorsement from most African National Congress branches to succeed President Jacob Zuma as ruling party leader, giving him an edge – but not a guarantee of victory – in this month’s election. Ramaphosa was nominated for the presidency of the ANC by 1,862 branches, while 1,309 backed his main rival Nkosazana Dlamini-Zuma, tallies released by the party’s nine provincial structures and collated by Bloomberg show. The branches will account for 90 percent of the 5,240 voting delegates at the ANC’s national elective conference that’s due to start Dec. 16, while the rest will come from the party’s leadership structures and youth, women and military veterans leagues. The ANC’s new leader will be its presidential candidate in 2019 elections, which will bring an end to Zuma’s second term. While the branch nomination numbers are the best available indicator of who’s likely to win, they aren’t conclusive because some bigger branches can have more than one delegate and there’s no guarantee delegates will vote as instructed. The election has caused deep rifts within the 105-year-old ANC, weighed on the rand and nation’s bonds and unnerved investors seeking political and policy clarity. The process of deciding who will get to attend and vote at the conference has been marred by court challenges, allegations of rigging and outbreaks of violence, casting doubt over whether the party will be able to stage a credible ballot. Gwede Mantashe, the ANC’s secretary-general, said most nomination disputes have been resolved and the lawsuits that have been filed were ill-considered and will be forgotten once the elective conference is over. The final two of the nine provinces released their nomination tallies on Monday. Ramaphosa secured backing from 391 branches in Limpopo and Dlamini-Zuma 104, while in KwaZulu-Natal Dlamini-Zuma won endorsement from 433 branches and the deputy president 193. Ramaphosa also won the most nominations in the Western Cape, Northern Cape and Eastern Cape, while Dlamini-Zuma was backed by the Free State and North West, and by a small majority in Mpumalanga who stated their preferences. Susan Booysen, a professor at the University of Witwatersrand’s School of Governance, estimates that about 930 delegates will come from branches that didn’t finalize their endorsements but may still be allowed to vote. Those delegates, together with 223 in Mpumalanga province who have yet to name their candidate and the party’s incumbent leadership and leagues could sway the final outcome, she said. Zuma, who has led the ANC for the past decade and been implicated in a succession of scandals since taking office, has been campaigning for his ex-wife Dlamini-Zuma, 68, to succeed him. She’s echoed his call for “radical economic transformation” to place more of the country’s wealth in the hands of the black majority. Most investors would prefer that Ramaphosa, 65, a lawyer, former labor-union leader and one of the wealthiest black South Africans, get the top job. He’s pledged to revive the ailing economy, reduce a 28 percent unemployment rate and combat corruption if elected. While nominations at previous ANC elective conferences were more or less in line with the eventual outcome, that may not be the case this year, according to Anthony Butler, a politics professor at the University of the Western Cape. 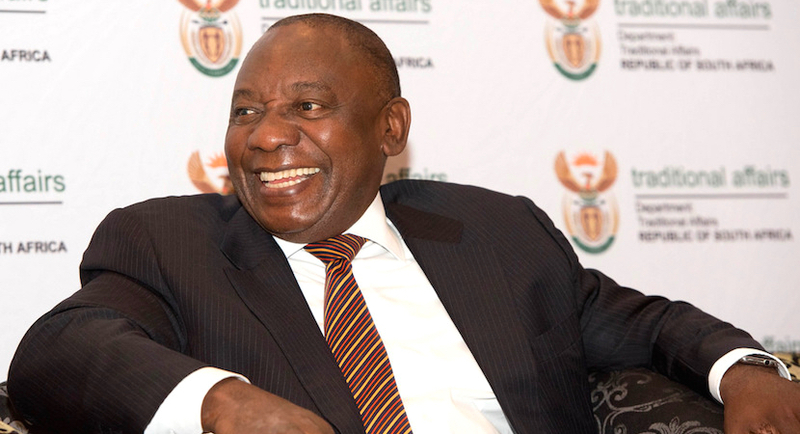 (Bloomberg) – South African Deputy President Cyril Ramaphosa won the backing of African National Congress members in the nation’s economic heartland and extended his early lead in the nomination process to succeed President Jacob Zuma as head of the ruling party this month. 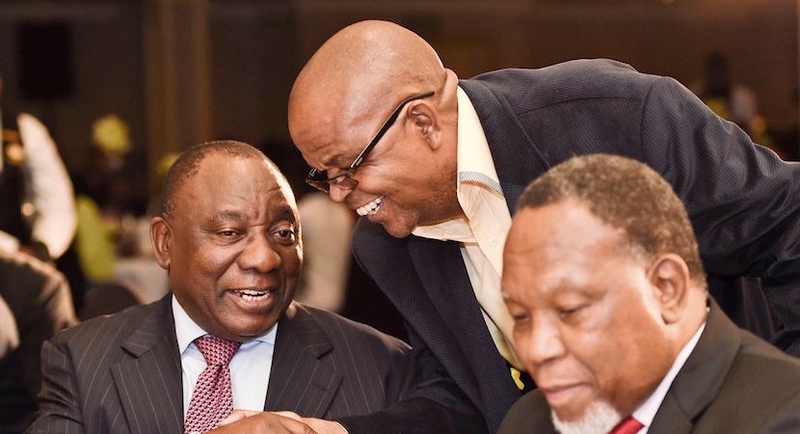 Ramaphosa won the endorsement for the ANC presidency from 374 branches in Gauteng, tallies released Saturday at a party meeting in Pretoria, the capital, show. That’s the fourth province to back him. His main rival, Nkosazana Dlamini-Zuma, Zuma’s ex-wife and favored candidate, was supported by 64 branches on the province, which include the nation’s commercial center, Johannesburg, and Pretoria. Gauteng will account for about 10 percent of the 5,240 voting delegates at the ANC’s national conference starting Dec. 16, the sixth most of the nine provinces. The new ANC leader will be the party’s candidate in 2019 elections, when Zuma is due to end his second term as president. The deputy president already secured nominations from the Western Cape, Northern Cape and Eastern Cape, while the Free State and North West back Dlamini-Zuma. Mpumalanga, which will send the second-most delegates to the elective conference and announced its tallies on Friday, is keeping its options open about who it will back, with almost half of its branches declining to name their candidate yet. The remaining two provinces should announce their favored candidates by Dec. 5. The majority of ANC branches in Gauteng nominated Human Settlements Minister Lindiwe Sisulu as deputy president and backed Senzo Mchunu, the former premier of the eastern province of KwaZulu-Natal for secretary-general. The party’s provincial chairman Paul Mashatile was backed as treasurer-general. The election has divided the 105-year-old ANC like never before and pitted Ramaphosa and party veterans against Zuma, who’s been mired in allegations that he allowed members of the Gupta family, his son’s business partners, to influence cabinet appointments and the awarding of state contracts. Most investors favor Ramaphosa, 65, a lawyer, former labor-union leader and one of the wealthiest black South Africans, who has pledged to revive the ailing economy, reduce a 28 percent unemployment rate and combat corruption if elected. Zuma’s preferred successor is Dlamini-Zuma, 68, who has echoed his call for “radical economic transformation” to place more of the country’s wealth in the hands of the black majority. While the branch nomination tallies are the best available indicator of who’s likely to win, they aren’t conclusive because some bigger branches are entitled to more than one delegate and there’s no guarantee delegates will vote as instructed. (Bloomberg) – South African Deputy President Cyril Ramaphosa saw his lead over Nkosazana Dlamini-Zuma narrow in the race for the presidency of the ruling African National Congress as the party’s branch nomination process drew toward a close. Ramaphosa has secured decisive endorsements from the Eastern Cape, Western Cape and Northern Cape, while Dlamini-Zuma was backed by an overwhelming majority in the North West and Free State, and won by a slim margin in Mpumalanga. 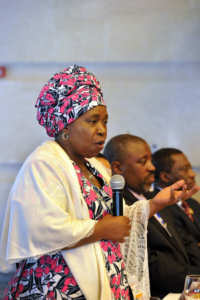 The deputy president so far has 904 branches to 708 for Dlamini-Zuma, the former head of the African Union Commission. Deputy President Cyril Ramaphosa addressing the closing session of the Indigenous and Traditional Leaders Indaba, June 2, 2017. 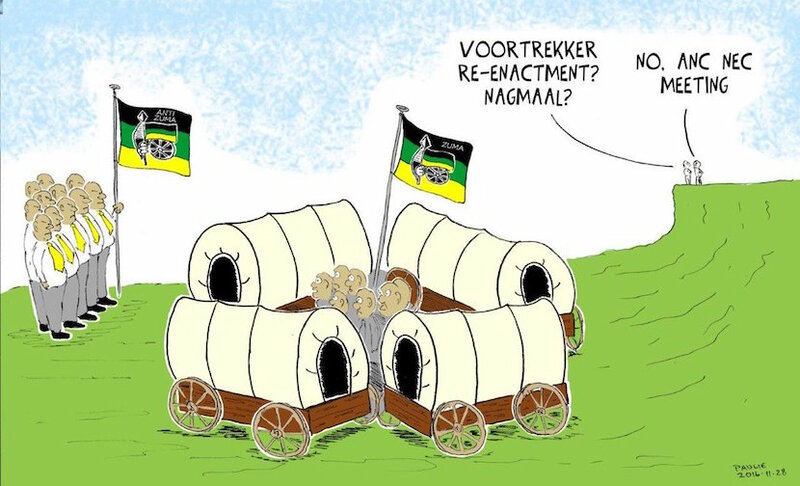 The contest has divided the 105-year-old ANC like never before, with court challenges, allegations of rigging and outbreaks of violence marring the process of deciding who will attend and vote at the conference. The election has also paralyzed several government departments as officials delay decisions until they learn who the new leaders will be. The winner of the election at the conference to be held on Dec. 16-20 will be the party’s candidate in 2019, when Jacob Zuma is due to end his second term as President. The remaining three provinces are due to announce their nominations over the next four days. Ramaphosa is likely to be endorsed by Limpopo and Gauteng, while Dlamini-Zuma has strong support in her home province of KwaZulu-Natal, which has the most ANC members. 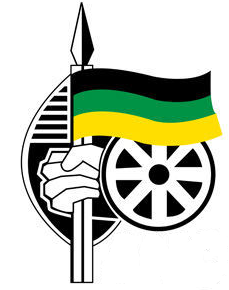 Ninety percent of voting delegates will come from the branches, and the rest from the ANC’s leadership structures and leagues representing the youth, women and military veterans. While the branch nomination tallies are the best available indicator of who’s likely to win, they aren’t conclusive because some bigger branches are entitled to more than one delegate and there’s no guarantee members will vote as instructed. Mpumalanga, which will send the second-most delegates to the elective conference and announced its tallies on Friday, is keeping its options open about who it will back, with almost half of its branches declining to name their candidate yet. It’s unclear how delegates from those branches will vote should no consensus be reached on who should succeed Zuma, meaning they could be a swing vote at the conference. Dlamini-Zuma won the backing of the North West province as expected on Friday, with 291 branches endorsing her to 45 for Ramaphosa. The region is one of the provinces in a rural bloc known as the Premier League that has helped Zuma, her ex-husband, thwart challenges sparked by multiple scandals that prompted calls from within the party for him to resign. Most investors favor Ramaphosa, 65, a lawyer, former labor union leader and one of the wealthiest black South Africans, who has pledged to revive the ailing economy, reduce a 28 percent unemployment rate and combat corruption if elected. Zuma’s preferred successor is Dlamini-Zuma, 68, who has echoed his call for “radical economic transformation” to place more of the country’s wealth in the hands of the black majority.